The Detroit Lions visit the Chicago Bears in Week 11 of the 2017 NFL season. PFF previews the top player matchups of the game. 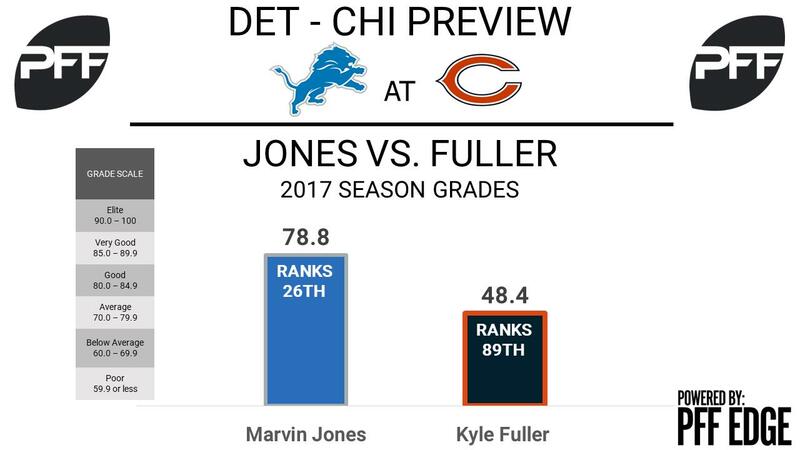 WR Marvin Jones vs. CB Kyle Fuller – Since the Lions Week 7 bye week, the league has seen a dormant Lions passing offense come alive. Fueled by a deep passing attack, the Lions have attempted the fourth-most throws of 20 or more yards downfield over the past three weeks. Enter, Jones. Jones has been quarterback Matthew Stafford’s favorite receiver to target down field this season and the proof is in the results. On targets 20 yards or more downfield, Jones ranks third in catches with eight, seventh in yards with 257, and third in touchdowns with three. Stafford has a passer rating of 133.0 when targeting Jones on such routes. Matching up with Jones will be no small task for Fuller, who has given up a reception of 20 or more yards in six of his nine games. Fuller’s play this year has not been impressive as his 89th-ranked, 49.8 overall grade suggests. While in coverage, Fuller has given up the third-most yards at 527. This should be a matchup the Lions look to exploit. RB Theo Riddick vs. LB Christian Jones – Riddick has been a nightmare matchup in the passing game for the past several years. This year hasn’t been different, as he has produced the seventh-highest yards per route run average with a mark of 1.92. Riddick has also been very effective making defenders miss, notching 12 forced missed tackles on receptions, the fourth-most among running backs. Overall his receiving grade of 81.9 stands as the 10th-highest among running backs. Riddick will likely draw Jones in coverage on a majority of pass plays. He has struggled in coverage this season, allowing a catch rate of 87.7 percent as well as 1.17 yards per cover snap which ranks 52nd out of 77 qualifying linebackers. Lions offensive line vs. Bears defensive line – For the first time this season, the Lions are expected to put out their top offensive line unit in the form of all five projected starters. Through 10 games, the Lions line has struggled mightily at times failing to consistently protect Matthew Stafford, allowing the fifth-most pressures league wide with a mark of 123. The Lions line has also produced the fewest yards before contact per carry in the run game at 0.40. The Bears on the other hand feature a defensive line that has produced the fifth lowest pressure rate, effectively rushing the passer at 31 percent and they also allow the third most yards before contact while defending the run. With the Lions bringing a healthy starting five to the table they hope to win this matchup. 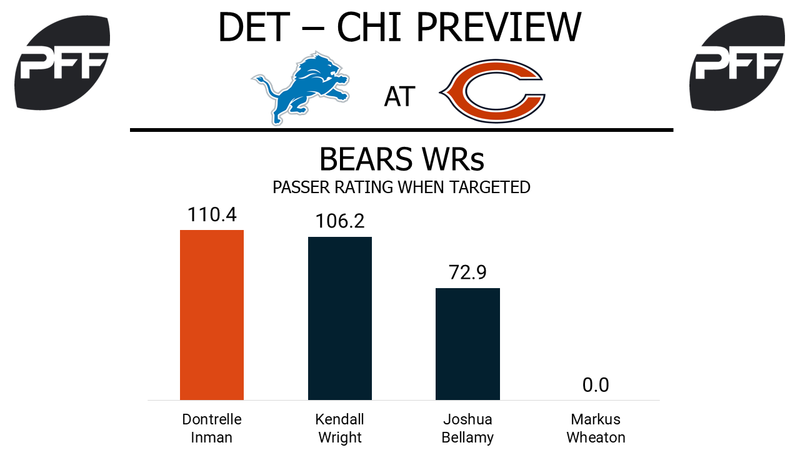 WR Dontrelle Inman vs. CB Darius Slay – Inman made an instant impact in his first game in Chicago last week, catching 6-of-8 targets for 88 yards, with 18 yards after the catch, for a 110.4 passer rating when targeted. His average depth of target was 11.6 yards down field, and his eight targets came against four different defenders in coverage. Inman will catch the attention of Slay, the ninth-highest graded cornerback in the NFL at 88.0 overall. Quarterbacks targeting Slay this season have just a 62.4 passer rating, this despite Slay being the seventh-most targeted cornerback in the league. He has only missed one tackle after the catch this season. RB Tarik Cohen vs. LB Jarrad Davis – After an early-season breakout, Cohen has only touched the ball eight times in the last three games. 30.9 percent of his runs this season have gone for zero yards or fewer, the third-highest rate of ‘stuffed’ runs among all running backs. He still ranks third at his position in yards per route run at 2.38, though. Davis has been the most-targeted Lions linebacker in coverage this season, and his 36.1 overall grade ranks 81st out of 85 linebackers. He has missed 13 tackles this season, tied for the second-most at his position, and his four penalties so far is also tied for second-most. T Bobby Massie vs. Edge Anthony Zettel – Massie is the 43rd-highest graded offensive tackle in the NFL this season at 67.9 overall, and he has allowed three sacks, three hits and 16 hurries on 292 pass-blocking snaps. His 22 total pressures allowed is the most on his team, and he’s already been flagged four times this year after drawing only three penalties last year. Zettel is in the middle of a breakout season as the Lions’ most consistent pass-rusher. He’s generated seven sacks, two hits and 21 hurries on 207 pass-rushing snaps, giving him the ninth-highest pass-rushing productivity rating (11.7) among 4-3 defensive ends. He is the Lions’ highest-graded defensive lineman at 83.4 overall and leads his unit in pressures generated and total stops.